The Premier’s Awards for Excellence in Education were created to recognize the enormous contributions of B.C.’s exceptional teachers, administrators and support staff that are vital to the cultural, economic and social well-being of the province. The Premier’s Awards provide students, parents, teachers and other members of the community with an opportunity to celebrate those who make a real difference in B.C. schools. The Awards are presented annually to exceptional education professionals in British Columbia’s school system working within either the public, independent or First Nations school systems. Nominations are now open. 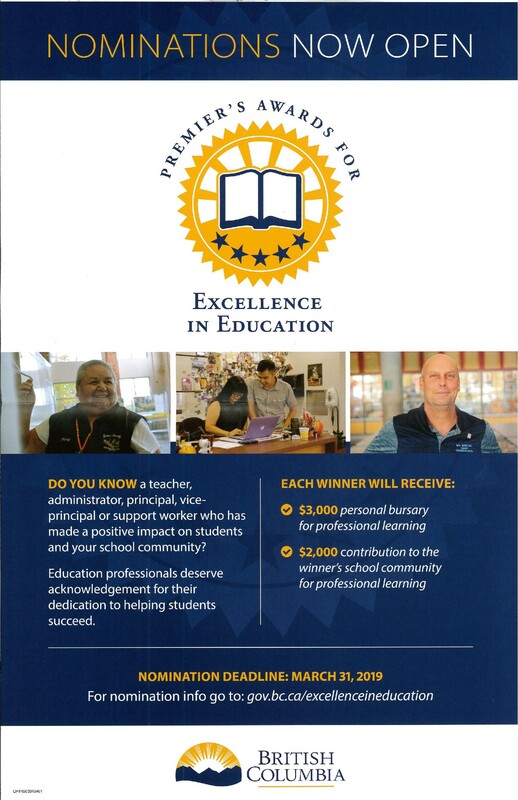 Winners receive a $3,000 personal bursary for professional learning, and a $2,000 contribution to their school community for professional learning.